This was a very busy week in June. After packing the truck with five rebreathers, ten tanks, two drysuits, one wetsuit, camping gear clothes, sleeping bag and many spare parts, I headed out to Gilboa Quarry in Ohio. The week included two classes; one a GEM Semi-closed sidemount class, and the other a full CCR sidemount rebreather class. On arrival, half of the gear was unpacked and setup for the next days class. 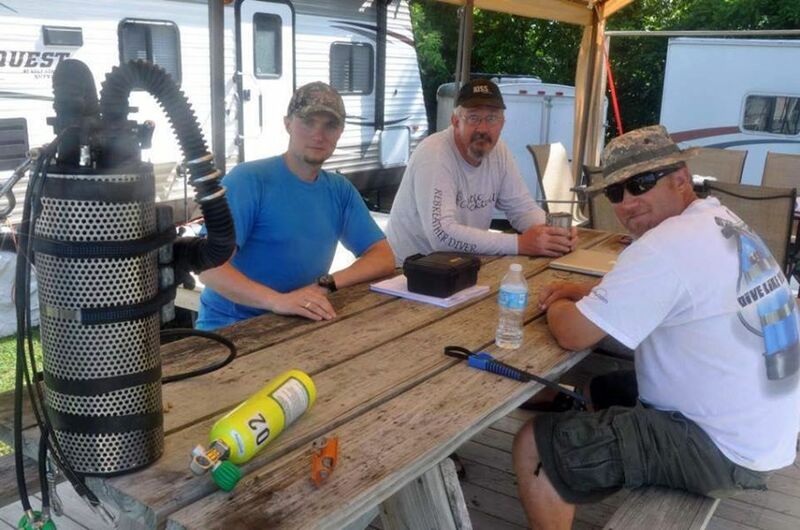 The first class was SCR using the GEM Sidekick sidemount rebreather. Balance, trim and proper buoyancy were some of the biggest issues. The rebreather operation was not as much a concern as proper position and weighting for the best work of breathing. I prefer to use an aluminum 80 for diluent / bailout. However the students were more accustom to steel tanks which required more weight to counter balance. We tried several different side mount harness during the class. Each had pros and cons. By the end of the class the divers were feeling much more confident and the buoyancy and trim were dialed in. The next morning started the CCR Sidekick class. After classroom work and gear configuration we hit the water for more trim and buoyancy work. After a few dives and skills we were circling the quarry and starting our decompression dives. On the next weekend we set up all of our rebreathers side by side to allow divers to go on demo dives. Divers tried out several different units. Others just stopped by to ask questions. All in all a great week of classes and diving. Diving season is around the corner, and we’re getting requests for classes. Drop a line if you are interested. This fall in the Northeast was a bad season for blowouts and poor visibility. Several hurricanes passed by, stirring up the surf. Often, this can help the conditions by mixing the surface water with the cooler water below the thermocline. Unfortunately this fall it cleared out the plankton on the surface, then just stirred up the bottom into soup. At this point, the surface had over 50 ft of visibility, but the bottom would drop to less than 5. That’s on the days we could make it out. On the plus side, this gave me the opportunity to drag some students up to Dutch and finish up classes. Once most of the drills are done, I dragged the camera along to grab a few shots. After this fall, I needed the practice or I’d forget how to work the housing. Also, I’m playing with a new lenses/port combination that takes some getting use to. For what it’s worth, here are some of the photos that came out well. A friend just asked an interesting question: Why have two counter lungs vs one? One counter lung only lets the scrubber work during half of the breathing cycle. If the lung is on the exhale side, then it inflates on exhale, but gas only passes through the scrubber on inhale. If it’s on the inhale side, then gas passes through the scrubber only on the exhale. If you have two counter lungs, half the gas passes through the scrubber as you exhale, and half passes through as you inhale. This makes the gas pass through the scrubber slower, (aka dwell time) and therefore the scrubber is more effective. I would also assume that the slower gas movement would decrease the work of breathing of the unit.